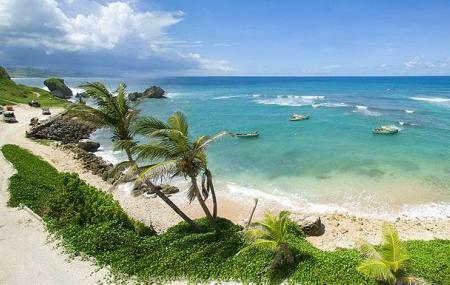 Locate near the Bathsheba beach, the picturesque Tent bay is home to a small local fish market. During early mornings and late evenings, you will find colourful local fishing boats making their way in and out of the bay. Although strong currents make it inadvisable to swim in the open waters at the bay, visit the place anyway to capture beautiful pictures, to enjoy a long chat with the locals and to have a delicious meal at the Atlantis Hotel which is situated near the bay. This landmark hotel has been serving guests for over 100 years! Hiring a taxi or renting a car/ bicycle is recommended. 20 minutes walking distance from Bathsheba city centre. Love this? Explore the entire list of places to visit in Bathsheba before you plan your trip. Fancy a good night's sleep after a tiring day? Check out where to stay in Bathsheba and book an accommodation of your choice. How popular is Tent Bay? People normally club together Bathsheba Beach and Andromeda Botanic Gardens while planning their visit to Tent Bay.